[0:29] <DMackey> Evening... quiet in here tonight. [0:43] <AivarasK> How much time can resizing to 16GB take? I am running pi zero with no monitor so I can't see what's happening. [0:46] <sisel4> you connected it by hdmi? [0:47] <sisel4> Have you tried changing hdmi cable? [0:47] <AivarasK> trix`G, it's Samsung's evo, ~7MB write/25MB read. [0:52] <pksato> vOina: on boot, use key 1 or 2 to select hdmi mode. [1:45] <kevireilly> ah so it might be possible to automate for various ranges if you determine the range? [2:41] <giddles> when it overheats something starts to cut pi offline? [2:42] <pigrit> does it overheat ? [2:42] <giddles> in the case of "if"
[2:47] <sisel4> Some time ago i was recording from this cam using motion, but motion was running on other machine. [2:49] <giddles> ja motion is a "drama queen"
[3:00] <pigrit> sisel4: what do you do for the outside sensor, just use a very long wire ? [3:02] <giddles> how do you save it from lightnings? [3:04] <pigrit> but how long is too long ? [5:15] <ziesemer> I'm looking to drive a loud piezo buzzer as an alarm from a Pi. I'd be interested in using the available hardware PWM from one of the GPIO pins. However, I'm concerned about not being able to provide enough voltage (5-20 V) or current for sufficient volume. Is there anything I should consider shy of a relay, separate oscillator, and an external power source? [5:23] <ziesemer> exonormal: Reviewed - but I don't think I'm seeing anything here other than driving a piezo directly from a GPIO pin? Even for those that have had "successes", I'm afraid they were on the verge of damaging the Pi due to over-currents? [5:32] <CoJaBo> ziesemer: a transistor or something? [5:34] <ziesemer> I've seen several references to such - but nothing with as much as a schematic for this purpose. [5:35] <Ub3r> Couldnt you just use a Capacitor ? [5:36] <ziesemer> Probably. I'm better at the programming than the electrical engineering. [5:36] <ziesemer> PWM was just a nice thought, to be able to drive multiple frequencies: Could generate different tones, etc. [5:37] <ziesemer> Would probably be an overkill, but could I just take the PWM output and wire it to something like https://www.adafruit.com/products/1752 ? [5:39] <ziesemer> I'd probably still use piezo speakers just to keep things small. Just looking for a loud alarm - don't need to be concerned with the "sound quality". [5:41] <ziesemer> In looking at that board again, I see that there are solder joints for both input and output - so that would seem to bit the bill for connecting a PWM input and a piezo output. [5:43] <ziesemer> Looks like either would need its own power source, though? [5:44] <ziesemer> No driving from the 5v rail? [5:46] <ziesemer> Or maybe https://www.adafruit.com/products/1712 ? [5:46] <ziesemer> Yeah, 2.4A supply at current. [5:49] <ziesemer> So it sounds like the PowerBoost (1712) is my best option. [5:51] <pigrit> ... https://www.adafruit.com/products/1739 ? says "it's plenty loud"
[5:53] <ziesemer> Guess I could give it a try. [5:53] <ziesemer> I can't even give it 5v without "something" extra here. [5:53] <ziesemer> The GPIO output is only 3.3v. [5:53] <exonormal> ziesemer: do you have a arduino uno? [5:53] <ziesemer> No, but will need to give it a try. [5:54] <ziesemer> exonormal: No, at least not yet - just a bunch of Pis. [5:57] <ziesemer> I believe you, but where I can reference this and any other such finds for myself? Per https://www.raspberrypi.org/documentation/usage/gpio-plus-and-raspi2/ , they are all 3.3v? [5:58] <ziesemer> Those aren't GPIO, but solid power. [6:00] <ziesemer> There'a also just not a lot of amps available on the 3.3v rail (for GPIO). So if there was a circuit I could use to amplify up to the 5v (or higher), that would be ideal. [6:02] <ziesemer> Ub3r: That's what I was hoping for. Just need to figure out which one to get, I guess. [6:04] <ziesemer> Thanks for providing me that assurance. I'll see what I can find that matches the input/output specs. [6:05] <ziesemer> exonormal: Not sure that NFC link was correct / relevant here? [6:05] <ziesemer> pigrit: How loud? Anywhere near that of a door bell? [6:06] <exonormal> it worked for me..
[6:07] <Ub3r> exonormal; worked to do what? power a buzzer? [6:08] <ziesemer> I don't understand what NFC has to do with this? [6:09] <ziesemer> What about http://electronics.stackexchange.com/a/177533 ? Would get me up to 12v, at the understood loss of amps - which should be perfect for this? [6:10] <exonormal> yes you can do it that way..
[6:12] <exonormal> basically you are using the mosfet as a "switch"
[6:12] <ziesemer> Right, I get the design. [6:12] <ziesemer> IRLZ14PBF - that is compatible to be driven with a 3.3v signal? [6:13] <ziesemer> Just from the Stack Exchange diagram? In looking at the spec sheet at http://www.vishay.com/docs/91325/sihlz14.pdf , isn't it expecting 5v? [6:17] <exonormal> 5V at where? [6:18] <exonormal> why not just use a transistor? [6:19] <ziesemer> OK, will continue researching that approach. [6:20] <ziesemer> Just from my original link, "a MOSFET is ideal because no current flows into its gate while it is on." Does this imply that a transistor would do otherwise? [6:26] <ziesemer> So as an amplifier, even without a source, there would still be current - and probalby a small amount of buzzing. [6:35] <Ub3r> nyt; but the power should not pass from the collector to the emitter, unless power is applied to the base/gate ? [6:37] <exonormal> if you are worried about leakage in a transistor, use a relay. [6:38] <nyt> whos trying ot do what? [6:39] <nyt> controling the mosfet with what? [6:39] <nyt> and what kind of buzzer? [6:41] <ziesemer> But I can't switch a 5v pin. [6:41] <ziesemer> That was 5 for $3, with free shipping. [6:42] <ziesemer> ... is an overkill, though - in terms of volts / amps. [6:44] <Ub3r> you gonna use the transistor as ground? [6:49] <ziesemer> First diagram I've seen complete with the specs and all: Including the use of a 1k resistor. [6:51] <ziesemer> How high? 100k? [6:52] <ziesemer> k, will give it a try, thanks. [6:52] <ziesemer> RaMcHiP-Mobile: Your previous pastepin is also no longer accessible (/etc/interfaces). [6:53] <ziesemer> I think your wpa-* lines need to go below the iface line. [6:54] <ziesemer> That's why you're getting the "misplaced option" errors. [6:58] <RaMcHiP-Mobile> Seems to work! [7:00] <Aceed> Alright, I'm pulling the trigger on an rpi on Amazon. Is there a "What's the best rpi package on Amazon" FAQ I'm missing? [7:02] <nyt> why you need a package? [7:04] <uriah> Aceed: what country are you in? [7:06] <RaMcHiP-Mobile> ITS ALIVE!!! Thank you nyt!!! [7:06] <uriah> Aceed: what is it exactly that you need for your project? [7:15] <Aceed> Any other individual component recommendations? [7:18] <Aceed> What about SD card/wifi? [7:19] <nyt> sd? depends what size you want? [7:19] <Aceed> Those Samsung EVOs are the way to go? [7:25] <nyt> aceed lol do you really need that much space? [7:29] <nyt> have you seen the pine64? [7:46] <phb2k1> Does someone think the Pine64+ can emulate an N64? [7:47] <pigrit> I thought the N64 emulation still sucked even on desktop pcs ? [7:50] <pigrit> I mean first time I hear "mine runs ok"
[7:51] <pigrit> which emu ? [8:00] <pigrit> phb2k1: have you already tried (and failed) on a pi ? [8:02] <pigrit> it's a me! [8:02] <c0ma> is really raspbian the best disdtro for raspberry pi2? [8:03] <c0ma> no other options to consider? really? [8:04] <mlelstv> "the best" is of course very subjective. But Raspbian probably suits most people. [8:04] <c0ma> one question, about retropie: does this come with all the games? is this included or just the emulators/etc ? [8:05] <c0ma> yeah I know what you mean. well I want something nerdy... I was a linux user back some years ago. used slackware. [8:05] <c0ma> thought it was no games, just wanted to make sure. thx. [8:06] <phb2k1> is someone here with knowledge about c programming and threads? [8:08] <c0ma> checking out http://www.lakka.tv/ ! [8:20] <nyt> phb2k1, what you need to know? [8:20] <phb2k1> u know wiringPi? [8:21] <phb2k1> and RCSwitch library for Arduino? [8:30] <mlelstv> you could use the Pi as the desktop and make the PC control the lighting instead. [9:53] <AiGreek> it's a good screen ? [9:54] <AiGreek> it's ... (how to say that..) responsive ? [10:05] <pigrit> anyone got a clue re: fullscreen touch GUIs ? [10:25] <phb2k1> can the pi do software serial? [10:28] <Xark> phb2k1: I don't believe s (timing requirements would need to be too tight - at least without some kernel module). [10:56] <phb2k1> shall I use the UART? [10:59] <phb2k1> can I use other ports than UART for I2C on the Raspi? [11:01] <Xark> phb2k1: Perhaps SPI? [11:05] <phb2k1> Xark: can I setup SPI on any GPIO pin? [11:07] <Xark> phb2k1: You can bit-bang it (not speed sensitive). However, HW SPI is only certain pins. [11:08] <Xark> phb2k1: Only SCK, MOSI, MISO (and GND). [11:09] <Xark> phb2k1: I2C could work too. [11:09] <Xark> phb2k1: Do you need bi-directional coms? [11:11] <Xark> I think this means you can omit MOSI line for SPI. [12:20] <TinkerTiger> Hmmm, like me! [12:58] <asdd> What are some commercial products made with raspberry pi today? [13:00] <t3chguy> the SoC on the RPi houses most of the functionality, so why not just put that into the Commercial PCB? [13:01] <gordonDrogon> the Compute Module was intended for that, but I suspect the Pi Zero will suffice for the most part. [13:02] <gordonDrogon> you don't need anything from broadcom to use a Pi based module in a commercial device. [13:03] <gordonDrogon> and big commercial companies do talk nicely to each other anyway. [13:04] <gordonDrogon> there are currently some big advertising boards with HDMI displays based on the Pi. [13:05] <asdd> gordonDrogon: compute module looks like a good idea. do u think it is cost-competitive? [13:05] <gordonDrogon> I don't think the CM is terribly cost effective, but it might be for some people. [13:05] <gordonDrogon> thats why I think the zero is better - but the CM has more GPIO avalable to it. [13:06] <gordonDrogon> and e.g. 2 camera interfaces..
[13:06] <gordonDrogon> the whole broadcom thing is moot for the Pi anyway - you're not dealing with Broadcom, you're dealing with the Pi Foundation. [13:11] <gordonDrogon> you know what - I've heard all this before. [13:11] <asdd> gordonDrogon: I think it is a valid concern. No? [13:11] <gordonDrogon> and while you are right - that's the way it seems to be, yet millions of people stilll buy them. [13:12] <nid0> if you're a small enough business for the pi to be a viable option, you didn't have your own in-house hardware design to begin with. [13:12] <asdd> i wonder ... will software skills be more valuable in future? will pay go down for hardware folks in the near future? [13:12] <gordonDrogon> asdd, it doesn't need to be a valid concern. If you want a small system running Linux with some usable GPIO then the Pi will "just work" with no involvement from the actual chip manufacturers required at all. [13:13] <gordonDrogon> if you want the nitty gritty of how the gpu works, then perhaps the Pi (or Broadcom) isn't the device for you. [13:14] <asdd> gordonDrogon: but if u're running a business that uses broadcom, u tend to worry because of the zero support u gonna get if u're not big enough to be worth their attention. [13:14] <gordonDrogon> personally, I've given up caring. The only thing makers of commercial kit will probably be most concerend about is supply of what's now a rather old part - however the Pi Zero has confirmed that they're still making that part - in large quantities too. [13:15] <gordonDrogon> I understand the foundation have given commitments to volume manufacture - and even Farnell will make you a custome designed Pi solution - min. quantity if 5000 units I think. [13:16] <asdd> gordonDrogon: cheaper than making our own boards for 5000 machines with HDMI displays? [13:17] <gordonDrogon> I'd be surprised if there was a self-contained board that could display hdmi video and graphics and have the GPIO needed to run a gambling machine that was cheaper than a Zero. [13:17] <asdd> gordonDrogon: will hardware engineers' salaries be depressed by boards like Pi Zero? who would need hardware folks to design new boards with Pi Zero? [13:17] <gordonDrogon> I make a good enough living integrating Pi (& other small systems). [13:18] <gordonDrogon> so - what are you getting at. What do you do, asdd ? [13:19] <asdd> gordonDrogon: i write firmware. [13:19] <asdd> gordonDrogon: can interpret schematic but don't know how to do pcb layout. Rpi is good for people like me. [13:20] <asdd> gordonDrogon: more people seem to shun hardware. do u get the same feeling? [13:21] <gordonDrogon> not really. we still need cpu designers. [13:21] <gordonDrogon> still need people who can put those cpus on boards. [13:21] <gordonDrogon> and people to write the software for them. [13:26] <gordonDrogon> just join the dots..
[13:27] <gordonDrogon> so learn the high speed stuff - I worked with some folks recently who were doing 60Ghz modems ... Now they're up to 78Ghz I think.. Quite cool stuff. [13:34] <sgo11> hi, how can I use my USB audio card? It's recognized properly in alsamixer and aplay -l. but it never works. I tried all the methods I can find in google. none of them works. [13:36] <Xark> sgo11: Did you try raspi-config audio settings? [13:36] <sgo11> Xark, I never try that. should I change all my modification back before running this tool? thanks. [13:37] <Xark> sgo11: Not sure? I guess try it without first. [13:38] <Xark> sgo11: Hmm, no, I am incorrect. I think that is just for HDMI vs headphone audio (not USB). [13:38] <sgo11> Xark, ok. yeah. [13:52] <sgo11> I think my problem might be there is also a usb midi keyboard which is using snd-usb-audio somehow. [14:00] <sgo11> I can never make usb audio card to be 0 when I plug in midi keyboard. But I have to use my midi keyboard. [14:01] <sgo11> why can't I simply make usb audio card to be the default audio card instead of making it to be card0 ? [14:14] <pigrit> sgo11: https://www.raspberrypi.org/forums/viewtopic.php?f=28&t=52106 - relevant ? [14:15] <sgo11> pigrit, it does not work. [14:16] <sgo11> pigrit, I tried most posts in google. [14:16] <sgo11> none of them mention what I should do when there are two USB audio devices. [14:18] <pigrit> well they still get different ids ? [14:22] <pigrit> can you select the one you want from alsamixer ? [14:23] <sgo11> pigrit, all solution in google is trying to make usb audio to be card0. but my problem is I have two usb audios. and the keystation88 always becomes card0. [14:23] <sgo11> pigrit, I can. but no help. [14:25] <sgo11> pigrit, actually, after setting card1 to be default card in /etc/asound.conf, alsamixer will load card 1 as default sound card. but I don't know why. the system sound won't use card 1. all solution in google is trying to make the preferred sound card to be card0. [14:36] <pigrit> sgo11: this may be stupid but have you tried swapping usbs ? [14:37] <sgo11> sisel4, thanks, I may try that later. [14:41] <sisel4> sgo11: pulseaudio isn't cool because is's addational layer in sound system, it has quite high latency but it's quite simple to use and there is simple gui (pavucontrol) to select audio device, contol volume and etc. [14:42] <sgo11> sisel4, I don't want to use any x server. I am building midi synth. I can not have high latency. [14:47] <sgo11> but usb audio card has latency. I can not use it as midi synth. the default sound card has noise/hiss when there is no sound output. I also tried many ways, no solution. it seems that is a hardware issue. [15:22] <engblom> If I would want to write a binary number for setting several GPIO pins at once (not as a sequence), how should I do it? [15:24] <engblom> I would want to avoid that 0111 -> 1000 becomes (as when doing it sequencially) 1111 -> 1011 -> 1001 -> 1000 as that means an out put of two wrong values. [15:29] <lopta> engblom: You'd want to mask them, I should think. [15:30] <engblom> lopta: The question is more what tool I should use? Under /sys/class/gpio/ I can only access one pin at the time, not the whole gpio module. [15:31] <lopta> engblom: I don't know whether the library you're using lets you set pins individually but the old-fashioned way of doing it would be to read the port first, let's say you get 1010 back and you want to set the middle two bits to 10, then you could bitwise AND it with 1001 and then bitwise OR it with 0100 and then write it out. [15:31] <lopta> No idea how you do that on a Raspberry Pi though. [15:33] <lopta> I've never programmed the Raspberry Pi, so I couldn't say. [15:34] <lopta> I need to go to a place and plug a thing in. Hopefully I'll be back here this evening. [15:56] <Hobby> Has anyone had issues with the adafruit case for the raspberry pi model B? [15:59] <Vanfanel> Hi. Does anybody know who did the SDL2 backend for Raspberry Pi? [16:00] <AlexC_> I've got a keypad which requires 7 GPIO slots, and on the Pi that I have (B2 I believe) I don't have a full row of 7 GPIO pins (ground or power pins are in the way). What's options do I have besides using a big breadboard and lots of wires? I'm thinking maybe there is an extension you can get which provides more GPIOs that are all in a line? [16:04] <t3chguy> AlexC_: why not just use Dupont Female to Male cables? [16:05] <AlexC_> t3chguy: Just what I was after, thanks! [16:16] <[Saint]> I'll sell you some issues if you want. [16:16] <[Saint]> I've got plenty. [16:27] <JakeSays> anyone ever used efl on the pi? [16:27] <gordonDrogon> engblom, wiringPi has a digitalWriteByte() function. [16:28] <gordonDrogon> engblom, it will write an 8-bit value to the first 8 usable gpio pins as quickly as it can - however it takes 2 operations to set the bits correctly - that's due to the way the gpio hardware works. [16:30] <gordonDrogon> Hobby, the old case with the "dragon claws" ? [16:36] <gordonDrogon> probably newer than the ones I had - they were all clear. [16:58] <brianx> Xark: connected a zero back to back with the pi (crossing rx/tx, connecting ground) and receive from the zero but can't see any evidence that it sees me transmitting. there are plenty of console messages but no evidence of a getty running. [17:09] <brianx> Xark: same result on pi zero <--> pi2b. maybe this image doesn't have a getty running. [17:57] <brianx> if you're in the us, try microcenter. [18:00] <Ub3r> SpeedEvil; shipping for me was $4.97... you live at the north pole? [18:01] <traeak> which getty? from the ttl ? [18:02] <brianx> the one for gpio pins 8 and 10. getting boot messages but no getty yet. [18:02] <brianx> actually using an old CD-ROM audio cable, the one that goes to the sound card. pulled the pins out and inserted ground straight through, rx and tx crossed. [18:04] <brianx> IT_Sean: it looks like it's practical to boot a zero with nothing but a spare micro usb phone data cable. not working yet, but usb gadget promises to get me to booting off sd and ethernet over usb. [18:04] <brianx> IT_Sean: there's a boot from usb option on the A posted on github that should also work on the zero. [18:06] <brianx> i hope to blog the full directions to connect your pi zero to your pi b(+/2) without anything more than a cable but i'm sure that's a week away still. [18:13] <Ub3r> I was gonna wait to order one from pimoroni but shipping would have been way more for me from them... even though they have better price for the items. [18:22] <Kymru> does anyone know any where to get a case 3d printed in the UK? [19:07] <IT_Sean> try shaking your router. [19:07] <IT_Sean> it lines up all the bits so they go through the wire more smoothly, and thus, more quickly. [19:08] <IT_Sean> All it takes is one bit to get wedged in there sideways, and BOOM. traffic jam. [19:10] <IT_Sean> Your router might be overheating! Drop it into a bucket of ice water. Leave it plugged in, though, so your connection doessn't go down. [19:16] <IT_Sean> Is it the one your ISP 'gave' you? [19:17] <IT_Sean> I never liked the combo whoosits... they are always more trouble than they are worth. [19:18] <DMackey> WHat model is it? [19:38] <brianx> t3chguy: systemctl is not available, the computer is not reachable when booted, the only access i have is to the sd card while it is not running. [19:40] <brianx> t3chguy: any idea where the docs for that link creation might be? i think i have the link right but it's not functioning and i don't have enough access to diagnose, my only option is to be sure it's right. [19:45] <brianx> going to just dump this image and write a fresh jessie to it. [19:54] <c64joystickguy> Hi all. I've got a Pi2 for XMas and I'm making a retropie out of it. Most of it works fine but I have a problem loading the db9_gpio_rpi driver on startup. [19:57] <DMackey> Have you tried putting it in rc.local instead? [19:59] <t3chguy> c64joystickguy: does it work when loading manually using modprobe? [20:01] <Tenkawa> what was the error? [20:01] <c64joystickguy> "Failed to start Load Kernel Modules." [20:02] <Tenkawa> did you read manpage modules and make sure the formatting was consistent? [20:04] <c64joystickguy> tenkawa: I did not read that. I did what I some people said to do on forums. I'm still a novice to linux in general, I've got lots to learn. [20:12] <c64joystickguy> DMackey: adding the line to rc.local seems to work. Is there any reason why it would be better to find a way to make it start from /etc/modules instead or it is roughly equivalent? [20:12] <brianx> t3chguy: it worked to just reimage the sdcard from a new download. maybe my antique install that had gone through lots of upgrades to reach jesse was just too messed up. [20:15] <c64joystickguy> To be perfectly honest, I don't know what systemd or sysvinit does. I'm really new to this... I'll try to learn about this. [20:17] <c64joystickguy> I hope I will! It's a bit intimidating coming from more commercial OSes where everything is made to be invisible. [20:21] <brianx> Tenkawa: you'd appreciate that i'm an sco ace then. [20:21] <Tenkawa> brianx: nice.. unixware!!! [20:21] <Tenkawa> oh like v4? [20:22] <brianx> they just hadn't started calling it unixware yet. [20:22] <Tenkawa> actually now that i think about it my xenix days I think were older. [20:26] <gordonDrogon> I learned C on that. [20:27] <brianx> i remember pdp11 but just barely. i was in grade school. [20:33] <brianx> gordonDrogon: wow, better than my pocket one. seems like i lose it for 10 minutes and the battery is gone. 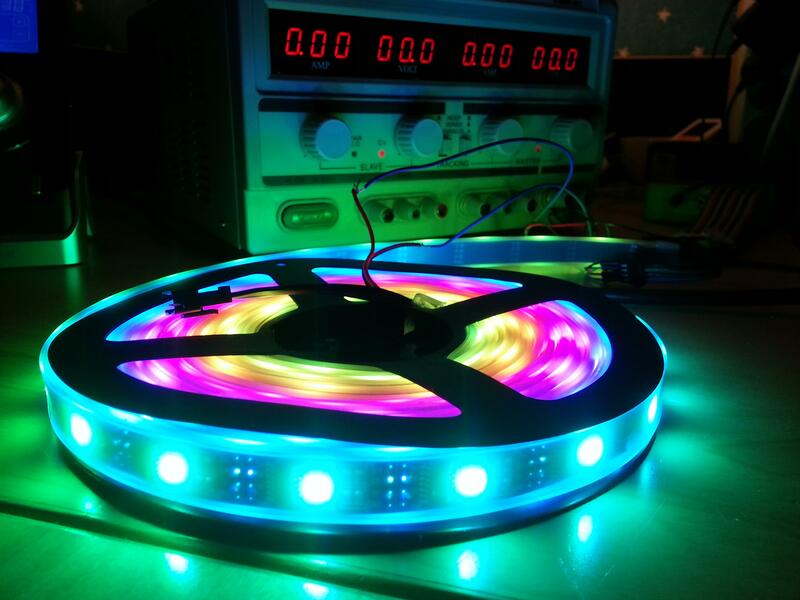 [20:35] <t3chguy> ThePendulum: what LED Strip? [20:40] <ThePendulum> does anyone have a working application for a WS2811 strip? [20:41] <gordonDrogon> brianx, it's one of the early seedstudio DSO Quad devices. [20:44] <ThePendulum> t3chguy: afaik they have the same problems as the WS2811s? [20:49] <ThePendulum> wait 3W each? [20:58] <brianx> gordonDrogon: so is mine. never did hold a charge worth a damn. [21:06] <t3chguy> ThePendulum: stick an LED On it? [21:09] <t3chguy> and not just setting a static "image"
[21:16] <ThePendulum> a single flash contains the entire datastring? [21:17] <ThePendulum> chips sure, but the LED itself? [21:22] <t3chguy> pah I don't read specs! [21:29] <ThePendulum> Connect Raspberry Pi pin 18 to 74AHCT125 pin 1A. [21:31] <ThePendulum> "Raspberry Pi pin 18"
[21:32] <ThePendulum> would you connect it to GPIO 18 (pin 12) or pin 18 (GPIO24)? [21:35] <t3chguy> not enough power? [21:35] <t3chguy> how much current is your supply capable of :P? [21:40] <ThePendulum> a black one! [21:50] <t3chguy> you sure they're all in series? rather than in 2 "chains"? [21:50] <ThePendulum> hmm you think they stuck two 8×16s together or something? [21:55] <t3chguy> "10 Power: 0.3W ± 0.01%"
[22:09] <ThePendulum> t3chguy: does it matter what side you feed these things from? [22:11] <t3chguy> oh wow ThePendulum, if you set all pixels to 255,255,255 you'll be pulling 80WATTS! [22:15] <ThePendulum> t3chguy: if you're gonna correct me, at least say You watt?!!!?! [22:21] <exonormal> is it stranded wire? [22:21] <t3chguy> oh like in-wall wiring? [22:21] <t3chguy> the stuff that stays in place after bending lol? [22:23] <t3chguy> ThePendulum: test the level shifter? [22:23] <t3chguy> got a DMM? [22:26] <DexterLB> does anyone have any idea why this may be happening? [22:30] <Berg> DexterLB: why are you defining data? [22:36] <t3chguy> ThePendulum: picture of your level shifter? [22:37] <ThePendulum> t3chguy: a picture of my actual shifter or the datasheet for it? [22:48] <ThePendulum> How do I figure out what DMA channel to use? [22:50] <fluffet> anyone here done much LED strip stuff? [22:50] <ThePendulum> "my pi is just sitting there, it's doing nothing, I bought it for nothing, I don't know what I was thinking, let's plug some LEDs in"
[22:52] <fluffet> what are you planning to do with it? [22:54] <fluffet> really? was it hard? [22:55] <fluffet> well how did you get started with it all? [22:55] <fluffet> did you find some kind of guide on what to purchase, etc? [22:55] <ThePendulum> t3chguy: with a Pi I'd rather get a WS2801 no? [22:55] <fluffet> oh, are they easily adressable? [22:56] <fluffet> does it need some kind of external power source/any other cables? [22:58] <fluffet> what do you mean, pi stutter? [23:00] <fluffet> how did you guys learn all this? [23:00] <fluffet> are you EE students? [23:01] <fluffet> oh, bachelors or masters? [23:03] <fluffet> oh, like ages 16-19 or something? [23:05] <Lep2> If i just unplug the power from my pi is not that good right? [23:06] <fluffet> how do you shut down the raspberry cleanly? [23:12] <ThePendulum> THEY'RE ALL ON! [23:14] <fluffet> ThePendulum: is there some sort of library for animations? [23:17] <ThePendulum> t3chguy: isn't that for display more than LED strips? [23:18] <t3chguy> ThePendulum: Woo for Node! [23:21] <fluffet> what python file is that then? [23:32] <fluffet> can these WS2801 be shortened if needed? [23:33] <fluffet> and then the one with the right ID or whatever snaps up the information? [23:36] <t3chguy> ThePendulum: I'm just wondering whether there's a communique sequence that describes "no change"
[23:36] <fluffet> and then just cut away the extra? [23:36] <fluffet> What about heat generation? [23:37] <fluffet> should i get the ones with the plastic hosing then? [23:38] <ThePendulum> t3chguy: surely they shouldn't be able to damage themselves if the strip is unrolled? [23:39] <fluffet> what "density" is good enough for desk lighting then you think? [23:39] <fluffet> is 30 per meter enough? [23:41] <fluffet> okay, so, if you cut, is it easy to reattach? [23:43] <ThePendulum> you have a 4 meter desk? [23:48] <fluffet> is the default size for these like 5 meters? [23:49] <fluffet> DotStar is what i need for not controlled by clock speed right? [23:50] <ThePendulum> "Because the clock and data is seperated, you can use any processor speed or type to control these strips, and you don't have to worry about being careful with the timing"
[23:53] <JakeSays> how do i deactivate the swap file? [23:57] <wili> hey anyone tried https://github.com/Fornoth/spotify-connect-web ?